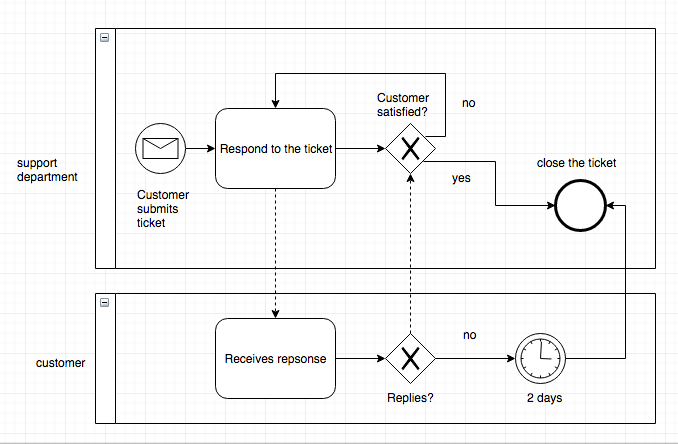 Business Process Model & Notation (BPMN) is like a flow chart on steroids. It’s the one true way to graphically map your processes and is a globally-recognized, standardized method. In other words, it’s information any business looking to draw reliable process maps needs to know. I compared it to a flow chart but much more than that: it has the functionality for representing things like information moving between teams, data being stored on the cloud, and departments working in parallel on the same process. BPMN makes it easy to understand the flow without actually understanding the exact symbols because it’s a simple, intuitive method. If you’re going to take a stab at mapping your business processes but don’t know where to start with transferring the rough notes and sketches into maps anyone can use, this is the article for you. It will get you acquainted with the basic concepts, and also give you references to deeper documentation you can use if you need it. Overall, this guide will work as a standalone for the majority of uses cases startups and small businesses face. 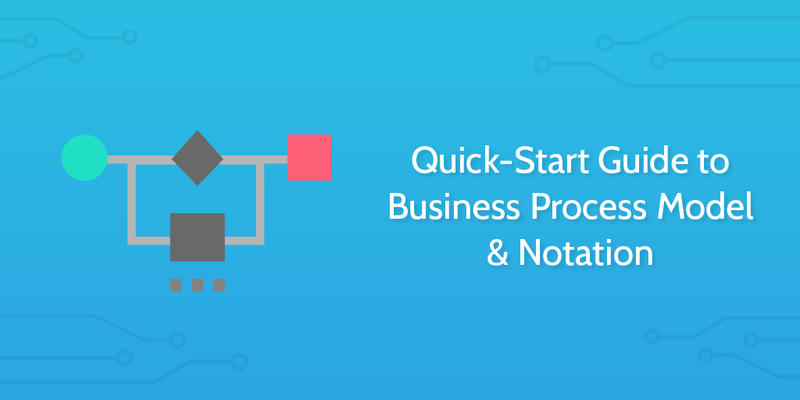 Business Process Model and Notation was originally developed under another name in 2000 by the Business Process Management Initiative — a non-profit organization founded by industry BPM leaders from companies like Ernst & Young and Versata. The aim was to standardize how processes were visually represented, and that aim has been carried on since 2004 by Object Management Group — a NFP technology standards consortium, snappily abbreviated as OMG. As businesses change — and IT becomes more vital — OMG keep BPMN updated, and able to handle new kinds of processes. At the time of writing, we’re on BPMN 2.0, which defines more symbols and map types to represent the real ways modern organizations get work done. Learning BPMN is similar to learning a programming language; while you can read overviews and short quick-start guides or watch video tutorials, the best thing you can do to get to grips is make sure you understand the basics, then start mapping out your business processes while reading the documentation whenever you’re not sure how to represent something. 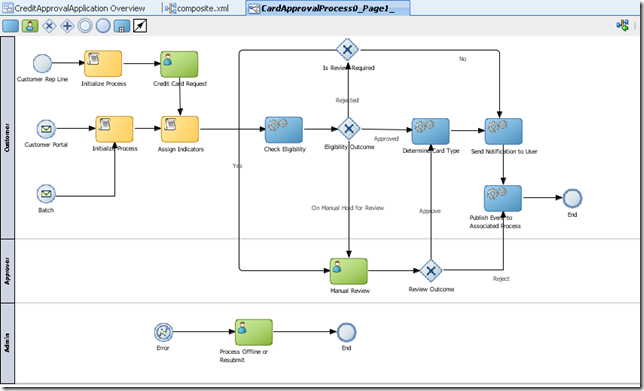 The canvas for a map drawn with BPMN consists of lanes and pools. Pools represent different organizations or entirely separate processes. Lanes represent different teams or individuals within the same organization. Pools are the biggest unit on a map: they’re the areas that contain lanes, events, tasks, etc. They represent who is doing the task. If we were to map our customer support process, there’d be one pool for Process Street and one pool for the customer. Work can flow between pools, signifying something like sending the customer a message. The main canvas (or pool) of a process map can be divided up into rows (or lanes). Each lane represents one parallel of the process, and shows both the exact tasks and responsibilities each department has, and the interplay between them. You’ll also notice some new shapes in the example above. The message shape signifies information transferred between two activities, and the shaded circle represents the end of the process. 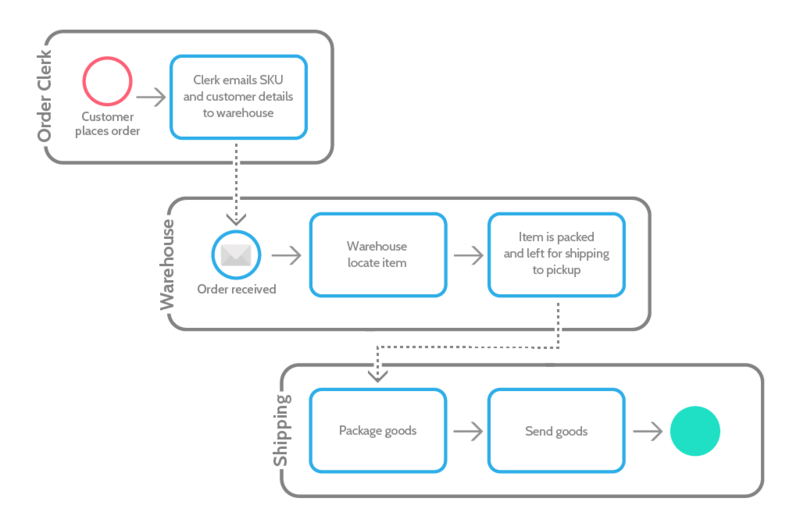 The basic shapes of BPMN are very similar to flow diagrams, but instead of representing pure logical stages, they can also represent business-specific actions, like messaging other departments, and escalating issues. Activities are simple for most purposes. Just a rectangle with rounded corners. They represent work to be done, like a checkbox on a checklist or an item on your todo list. Sequence flow the basic line that connects together elements of your map. It shows the flow of work, and is necessary for connecting together activities. Without a sequence flow, your map is invalid. Message flow is used when different departments or organizations send information between each other. Since you don’t get up and go and oversee the work in different departments when you want a task done, message flow represents a request or the sharing of information, not a strict action. It’s the only kind of flow that can take place between pools or lanes (organizations or departments). Association is used to tie documents, databases, and other artifacts together with activities. For example, if you had an activity to sign off on a purchase order, you’d use a document symbol and an association line to link the two together. Similar to diamonds in regular flow charts, gateways represent a split or convergence in the process chart. For example, when making a choice of what to eat, the process will split depending on the final meal choice, but will converge at the point where the meal is eaten, because no matter which meal is chosen, it will eventually be eaten. Not all gateways are choices, though. It could be that the continuation of the process depends on getting hold of more data, or waiting for a specific time, or meeting some other condition. In that case, it’s represented as an event gateway, and branches into whichever event takes place next. In the above diagram, take note of the time and message shapes — both very simple concepts that don’t need much elaboration! Time can either be days/hours/minutes or specific dates/years/quarters. Messages are any information directed by and to a specific recipient (individual, department, organization, etc.). It can be data, files, emails, phone calls, letters, etc. If a task isn’t dependent on another task, there’s no reason for them not to be done in parallel when the process begins. To represent this on a BPMN map, use a parallel gateway. All that signifies is that there is now a chance for both subsequent tasks to be started: the process breaks down into two parallel branches. Sometimes, a process can go only one of two (or any number of) ways. For example, either the podcast recording is accepted and moves onto the editing stage, or it’s rejected and moves back to the editor for another pass. An inclusive gateway breaks the process into multiple branches, with an explanation of which condition must be met for the flow to continue down that branch. Inclusive gateways allow for multiple possible outcomes to be selected. For example, the customer could be both ‘not satisfied with A’ and ‘satisfied with B’, and in that case they’d be sent the voucher and also get added onto the B list. To explain, above we have two pools with one lane each. The process is started by the customer, who sends a ticket to your company’s support team. Support responds, and then waits two days. If the customer hasn’t replied, the ticket is closed. If the customer is satisfied, the ticket is closed. Otherwise, communication continues until one of those conditions is met. It’s a massive oversimplification, but it’s a start, and a good way to illustrate the basic concepts. Draw.io is an amazing tool, especially considering that it’s 100% free. You can pay for features like integrations and compliance, but overall the core software is free, supports every BPMN symbol, and makes it easy to create great process maps. Microsoft’s behemoth of a process mapping tool — Visio — is the industry standard that all other mapping tools wish they could take down. Just because it’s the most widely used doesn’t mean it’s the best; it’s widely used because it’s packaged with Office 365 and other Microsoft packages. It doesn’t integrate, it’s incompatible on Mac, and it’s the most expensive. It is, however, easy to use and is the subject of a lot of helpful guides around the web. 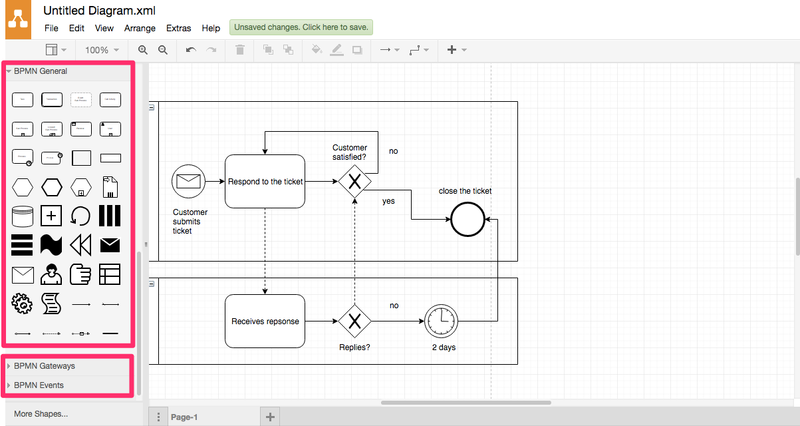 While Visio is quite a rigid product, Lucidchart allows for real time collaborative editing, chat, and comments. That can make process development in BPMN a collaborative activity, encouraging teams to work together and helping keep the process accurate with less margin for error. SmartDraw was designed with power users in mind, but that doesn’t mean it’s hard for new users to pick up. It groups its symbols in a similar way to Draw.io, meaning that all your BPMN symbols will be in one place, easy to access. The first step to implementing process maps using BPMN depends really on your starting point. If you have never mapped a process before, use this checklist to create one, and this checklist to optimize a process. As for implementing BPMN itself, just make sure to use a BPMN-compatible tool like the ones listed above, and refer back to the documentation if you need assurance. Thanks for another excellent article. I’ve used BPMN for a few years, but haven’t yet settled on a “good enough” tool – I’m always trying new ones. We need our clients to also be able to edit the diagrams once we have finished our assignment, I’ll give your suggestions a go. I’d also love to know what tool you used to create the BPMN graphics in this post – it doesn’t seem to be any of the ones you mention, such as Draw.io or Lucid Chart. They are really eye-catching, what did you use? Nice tutorial but how do you combine the rigid BPMN with the flexible ACM (adaptive case management) on which Process Street seems to focus? A really good point. We’re hoping to implement some of the BPMN features in Process Street in the near future. Awesome! Thanks for the encouragement. Hi there, great article. I learnt a lot. Is this sentence correct: “Parallel Gateways: If a task isn’t dependent on another task, there’s no reason for them to be done in parallel when the process begins.” Shouldn’t it be if a task isn’t dependent, then there’s no reason for them NOT to be done in parallel…?” I’m trying to make sure I understood what you were saying. Thanks. Also, “For example, when making a choice of what to each, the process will split depending on the final meal choice,” That should be “what to eat”? Thanks for that — ‘not’ is right, good catch. I’ve updated the article, and the ‘each’ mistake! Also, for Inclusive Gateways, would the third option have to cover all possibilities not met by the first two options, so Not Satisfied A or B -> Send voucher. ? This is literally one of the best articles I’ve read on BPMN tutorials. very straight forward and easy to understand. Thank you so much Ben! Great article, but what tool/app was used to make the graphics in the article? All of the nice looking ones were created by our designer using Adobe Illustrator, not an actual BPMN tool. The only exception is this diagram which was created with Draw.io. Thanks for the article, I enjoyed reading this. I’m decently familiar with BPMN myself but still got plenty to learn so I’m always keeping an eye out for articles which might help me look at things from another perspective. And I enjoyed reading this. Now, at the risk of coming across as a spammer (definitely not my intention!) but I hope you don’t mind me mentioning ‘Visual Paradigm’ as yet another tool which allows you to do BPMN modeling. Thanks again for the article, definitely going to skim around and check some of your other work. Thanks for the comment and the recommendation. Visual Paradigm isn’t a tool I was familiar with, it’s interesting to find out about. Hi, came here via your article on B2C. Since you have mentioned some tools I’ll pitch our tool Creately as well. It’s web based, support all BPMN icons and has real-time collaboration to work with teams and peers. The personal plan starts at $5/month so it’s affordable too. I using your tutorial to introduce students in my Systems Analysis, Design and Implementation class. I also plan to use it in my Project Management class. I am actually carrying out this role now after having completed into the organization as a BA. The points raised here are spot on and have really resonated with me. One thing I have found difficult is giving the time to the user stories and AC that I would like. This could be more to do with the effort required to get the team up and sprinting. The team gave raised it at the retro so changes are afoot!